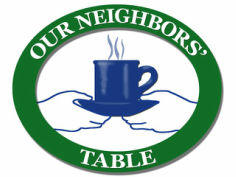 Whether you are sponsoring and serving at a weekly program, or letting the community know food security is important to you by sponsoring one of our community events, every dollar you give to Our Neighbors' Table is making another day hunger-free for a neighbor in need. Wednesday Meal Sponsorships start with a minimum gift of $500 and can accommodate volunteer groups up to 8 people. Read an overview of what's involved. ONT Market Sponsorships start at $800 and can accommodate volunteer groups up to 15, including children age 8 years and older. Read more details on the Market Sponsorship Program. Run Out Hunger: Sunday, October 20, ROH team runners complete the Newburyport Half Marathon and raise money for ONT. Sponsor recognition includes branded team jerseys and our race-day VIP tent. Fighting Hunger: Grill Master's Challenge & Brew Party: Sunday, June 9, this popular event returns to Brewery Silvaticus in Amesbury for brews, BBQ and live music. ​​Fill 'Em Up Fest: Saturday, September 7, Cashman Park in Newburyport serves as the backdrop for a food truck festival featuring craft beers and fun for the whole family. $250 field sponsorship level also available. Annual Breakfast: Tuesday, October 22, gathers more than 200 community members to share our impact on hunger in 2019. Submit your sponsorship inquiry today! Benefits are granted on a per event allocation. Additional sponsorship levels or benefits may be available for specific events. In-kind donations will be recognized for 50% of the fair market value of the donated item(s).